This is the first complete English-language translation of a classic of Yiddish literature, one of the great comic novels of the twentieth century. 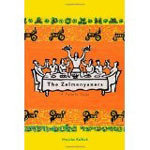 The Zelmenyaners describes the travails of a Jewish family in Minsk that is torn asunder by the new Soviet reality. Four generations are depicted in riveting and often uproarious detail as they face the profound changes brought on by the demands of the Soviet regime and its collectivist, radical secularism. The resultant intergenerational showdowns -including disputes over the introduction of electricity, radio and electric trolley -are rendered with humor, pathos, and a finely controlled satiric pen. Moyshe Kulbak, a contemporary of the Soviet Jewish writer Isaac Babel, picks up where Sholem Aleichem left off a generation before, exploring in this book the transformation of Jewish life.